Steel engraved map with original hand colouring. Overall size: 43cms x 35.5cms; 402mm x 330mm. Centrefold as issued. On verso is a description (one page) West Indies - Santo Domingo. Highly decorative spiral motif border. The hand colouring in Colton's recognizable pink and greens depicts various provinces and shows towns, rivers, province names and mountains. Inset map bottom left of Porto Rico. Reference key bottom midle for the the Parishes in Jamaica. Slight browning to sheet edge and faint waterstain bottom left blank margin corner and halfway up the left margin; one brown spot in Gulf of Mexico and one above the 'r' in Caribbean Sea else very good condition. 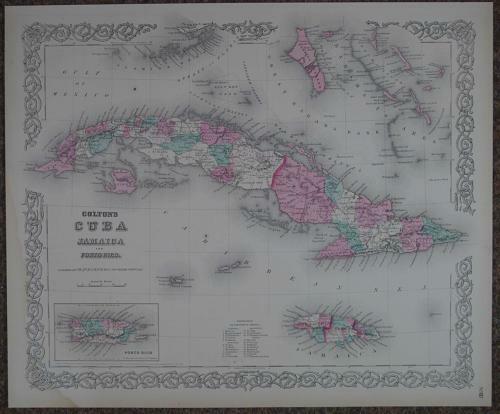 One of the most detailed C19th maps of Cuba. George Woolworth Colton (1827 - 1901) was the son of Joseph Hutchins Colton (July 5, 1800 - July 29, 1893) who was an important American map and atlas publisher operating between 1833 to 1897. JH Colton recognized a gap in the market and published guides for immigrants and updated maps with decorative borders after purchasing the copyright from cartographers such as David H. Burr. His two sons worked in the business with him on the vast output of railroad maps, guides and several atlases. The non payment of the fee from Bolivia for a large quantity of maps of the country was financially disastrous for the company. The maps are characterised by their decorative spiral borders and vibrant contemporary hand colouring.